Kansas City, Mo. 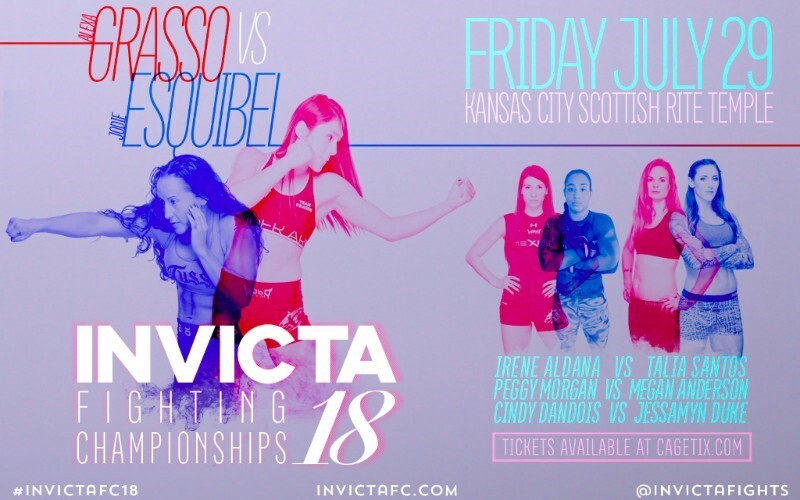 – Invicta Fighting Championships returns to Kanas City for its 18th event on Friday, July 29 as Scottish Rite Temple – a nationally recognized historic landmark – hosts Invicta FC 18: Grasso vs. Esquibel. Unbeaten strawweight phenom Alexa Grasso (7-0) makes her main event debut on UFC FIGHT PASS, taking on Jackson-Wink MMA product Jodie Esquibel (5-1), who returns to the Invicta FC cage for the first time since 2014. In the co-main event, Grasso’s teammate, former bantamweight title challenger Irene Aldana (6-2) welcomes 22-year-old Brazilian prospect Taila Santos (13-0) in her first appearance for the promotion. Additional bouts for Invicta FC 18 will be announced at a later date. Tickets for Invicta FC 18 go on sale Wednesday, June 22 at CageTix.com.